Join the discussion on our forums! Come discuss Avalanche over in our dedicated Avalanche discussion topic. Turn it into a Meteor with Ice Breaker. I feel like this card is difficult to evaluate. If you really think about it - it's the same efficiency as Fireball and it also Freezes, but the damage gets distributed in weird ways. It might be too clunky in practice, and/or easy to play around, but I can also see it work well too. Definitely a very good card, albeit can be played around as the opponent should. 4 mana that can deal 6 damage and freeze a minion. 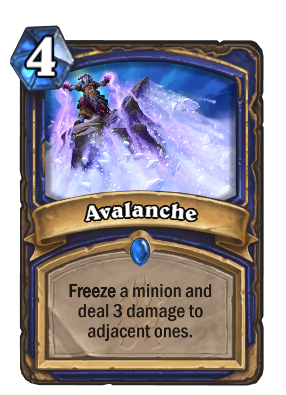 It is almost like casting two Frostbolts except only one minion will be frozen. Unlike Meteor, this is only good when your opponent has more than one minion. Also unlike Meteor, this can ruin your opponent's board the same turn that you drop a Bone Drake. I'm gonna give this card a solid B+. Oh so it's like reverse Meteor. So that can noone laugh at you and say "Lul positioning"? In general yes. If your up against 2 Giant Wasps, then no Multi-Shot is better. Not strictly better :) it all depends on your opponent's placement after all.